Earlier we presented a guide on rooting Motorola Moto G and this time, we are preseniting you an easy guide on rooting Motorola Moto X.
Motorola Moto X was stepped in just USA for some months but now it's also available in India! Yes, the mobile released in India too. You can buy Moto X from FlipKart now. But the sad thing is that Google sold Motorola Moto X to Lenovo in just some bucks! Not actually sad thing but we knew that Google would provide updates to Moto X and G every time new update the new update rolls but Lenovo would take time to roll an update for Moto X and G because they also need to manage their handsets like Yoga. 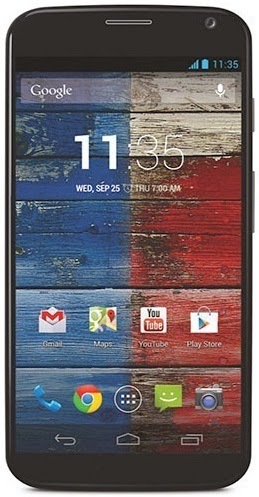 Motorola Moto X is the one of the best mobile phones I have seen till the date at this price range. The device is just for 12 thousands rupees in FlipKart (the price will likely to fall to 10 thousands in coming months) and because of its feature, the market is flooded in India. Motorola Moto X has 4.7 inches capacitive IPS touch screen with HD resolution of 720 x 1280 pixels and 329 ppi pixels density. The screen size is okay, means not too big and not too small, I personally like 5 inches device because they are more handy than 5.5 or 6 inches devices and there's better video experience in it when compared to 3.5 inch or 4 inch device. Best part of this device is processor! The device is powered by MediaTek Qualcomm SnapDragon 400 chipset which is clocked at 1.2 GHz, not dual core, it is a quad-core device. The RAM of this device satisfies the chipset and the OS requirements, the RAM you get in this device is 2 GB which is too much. There are two models of Motorola Moto X, one with 8 GB and second with 16 GB internal storage. With a 10 Mega Pixels rear camera, you can capture amazing photographs and in night, with the bright LED. The front camera is also good, it is 2 Mega Pixels and can record HD videos. It comes with Android 4.2.2 Jelly Bean OS but can be upgraded to Android 4.4 KitKat. Now lets move to rooting tutorial. Rooting means gaining superuser permissions to perform actions such as editing system and other partitions which cannot be edited until you have rooted your device in an Android mobile phone. Also you don't need to unlock the bootloader so don't be afraid that the OTAs won't come up! Because bootloader is locked, the device will receive OTA updates. NO! you don't need any kind of USB drivers, USB cable or any other hardware, just a simple application and working brain. The application uses bug 9695860 which is a flaw in the built and the application can easily gain root access by this bug. PwnMyMoto application (.apk package) from XDA: Click HERE. Download the required application (.apk), given in the downloads. When you are installed with it, then open the application. It will automatically root the device and will reboot it twice or thrice depending on the system status. When the last reboot will take place, the application would automatically uninstall itself and install SU binary files and supersu application in your system partition. If the device is rooted then it would display 1 with the answer and if 0 then try any other version of application. NO! Simply install SuperSU (if not installed by the PwnMyMoto) and go to it's settings. Then scroll down and select "Permanent unroot".